With the digital business world expanding rapidly, competition for customers is fierce. One of the best ways to increase conversions and turn website visitors into paying customers is incorporating great user experience (UX) design. Solid, well-crafted UX enhances a customer’s journey with your brand. 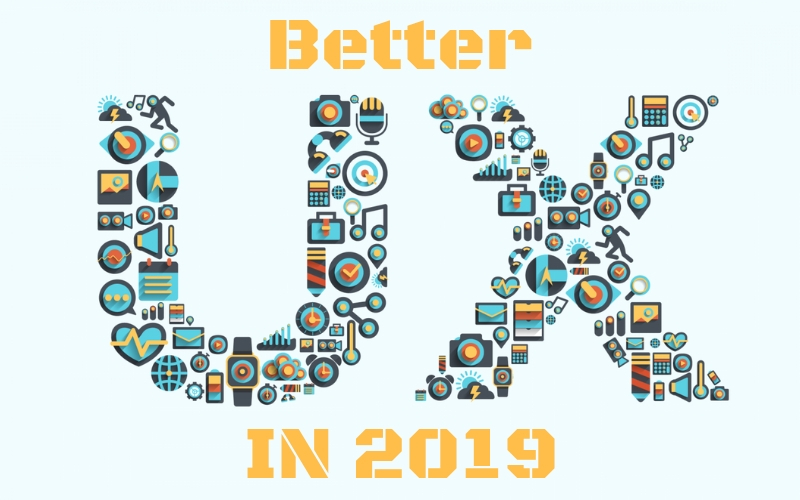 In the last year or so, UX design has advanced considerably, and it’s poised to change even more in 2019. There are some exciting trends developing that could reshape how we approach UX in the coming year. We’ve developed a brief guide covering some of these new trends, why they are vital to recognize, and what they can do for your brand in 2019. Less is often more, especially when it comes to User experience design. Minimalism is the concept of creating stunning designs with simplicity. When it comes to User experience design, users typically know what they want, and if they don’t know, they want to be able to find it quickly. While people often think of minimalism as a visual design concept, it is far more than just simplicity in visual design. The customer journey is crucial in modern businesses, and well-crafted, beautiful, minimalistic UX design makes the customer journey more enjoyable, less stressful, and more memorable for its users. With UX designed from a minimalist perspective, there should be a few steps as possible in the customer journey from a user’s first exposure to your brand to the moment he or she takes the action you want, such as completing a purchase, opting into an email list, or signing up for your newsletter or blog alerts. Don’t mistake minimalist for boring, however. Engage your customers without overwhelming them and make your site simple to navigate – without appearing bland and uninteresting. If you want customers to take specific steps, make those steps as clear as possible. Most customers browsing online won’t bother hunting around a webpage very long if they can’t immediately figure out what the next step is. When you use minimalist design, the steps in their journey with your brand should become crystal clear. The companies that make the most of minimalist design and create memorable, valuable and intuitive experiences for customers are the companies that will thrive in 2019 and beyond. The customer journey is a vital concept for modern designers, and it’s important to realize that it doesn’t always go as you may expect or hope it would. Another emerging trend addressing these situations is the branching customer journey. The basic customer journey depends heavily on predictive modeling. If a user performs action X, result Y happens, so you want to guide users in completing X as easily and intuitively as possible. However, rather than counting those users who do not complete X as failed opportunities, many UX designers are starting to think of these scenarios as branches on a customer’s journey path. Rather than focusing efforts solely on achieving one desired result, User experience designers are looking for new ways to map the possibilities of a typical customer journey and find opportunities to engage with users who stray from the desired route. In recent years, the concept of simplicity reigned supreme – the thought process was largely that simplicity equated to better usability, and thus an easier customer journey. However, this is a very results-driven approach to UX design, and in 2019, we can expect to see many User experience designers embracing the concept of branching paths and avoiding typical customer journey design structures. Conceptualizing the customer journey as a path with many possible routes will no doubt complicate UX design in many cases, but it also opens several doors. As more UX designers start to eschew traditional “A to B” thinking when it comes to the customer journey, they are going to start crafting UX that appeals to wider audiences and affords users several options on their journeys. No two customers are going to be the same, but they can both have fantastic experiences with a brand, even though they may take very different paths on their journeys with that brand. Failure mapping is the idea of essentially pinpointing the areas of a customer’s journey where some users take a path different from the desired one, and UX designers are starting to take these instances much more seriously. Failure mapping is essentially a more robust method of mapping the customer journey. However, with this method, User experience designers expand their model to incorporate the branching paths a user may or may not take. Modern consumers are far warier than past generations, and they typically conduct their own thorough research on brands before doing business with them. The days of the hard sell are long gone, and modern businesses are looking for ways to appeal to their target consumer bases on a more personal level. Brand storytelling is a concept that has arisen out of this mentality – brands are now letting customers know who they are, why they do what they do, what their values are, and how they plan to make the world a better place in their own ways. When a brand’s story resonates with a consumer, it creates a much more memorable connection than typical brand engagement, and customers are more likely to do business with companies that feel more human and approachable. In recent years, the idea of material design was everywhere in the UX world – designing with simplicity in mind that mimics the basic aesthetics of paper. Designers started to incorporate ideas like folds, shadows, turning pages, seams, and bold colors to craft UX that was intuitive and responded as a user would likely expect. Despite the hype about material design, it’s beginning to look like this type of visual UX is just going to be part of something bigger – textile design. Textile design describes several different design aesthetics and UX elements working in tandem, like different fibers woven together into one fabric. Each fiber or thread has particular elements that set it apart from the others, and each one can be identified on its own quickly, but when all of the different parts come together, a new type of experience emerges. The key to textile design for UX is to find the balance between providing a user with options and a variety of visual elements that work together intuitively without becoming overwhelming. Remember – minimalism is still important, and textile design is a concept that aims to marry minimalist User experience design with aesthetic appeal and intuitive user navigation. The companies that focus on these emerging trends in the User experience world are the ones that will be the most memorable and impactful in 2019. Make no mistake – UX has a definitive impact on your company’s bottom line. Simple UX flaws can hurt your conversion rate and lose valuable business. As you move your UX design efforts into 2019, one of the most relevant trends to remember is the nonlinear customer path. When you analyze why your UX is costing your company conversions, it’s time to stop looking for ways to patch that A to B journey, and instead start looking at what is drawing attention away from your desired user path. Readability, direction, ad placement, site stability, and site traffic can all impact UX positively or negatively. While some issues in these areas may just require some tweaking when you consider more possibilities on the customer journey, some of these apparent flaws could be hidden opportunities. Each year, UX evolves more, but good UX shouldn’t be geared toward one result. Start considering the entire customer journey, not just the end state or your desired goals. As your company enters the New Year, look back on your metrics for 2018 and start remapping the customer journey for your brand. This post is very interesting! Glad to know that less is still more this year. Thanks for sharing Stephen! I glad you like the post. Thanks, @Morgana. I think better UX is definitely a big SEO factor especially this year. UX and SEO should go well together. SEO is a part of user experience. One cannot ignore search engine optimization for a brand’s success. One cannot simply attract the traffic by implementing numerous SEO strategies. While one has in mind to drive traffic to the site, it’s necessary to enhance the users’ experience by connecting them in terms of design, content or even context, we need to think the way users do or the way they want to perceive things. It is important to understand users and manage their expectations through UX. And, it can be achieved if we understand their needs. Only then it gets better and works in true sense. Simultaneously, calling an alliance for SEO and user experience won’t be wrong here. There are clear benefits when you align SEO and UX while building your site. I hope, as you said, this union really goes well.